I honestly don't even know where to begin. Running Ragnar Northwest Passage was even better than I imagined it would be. 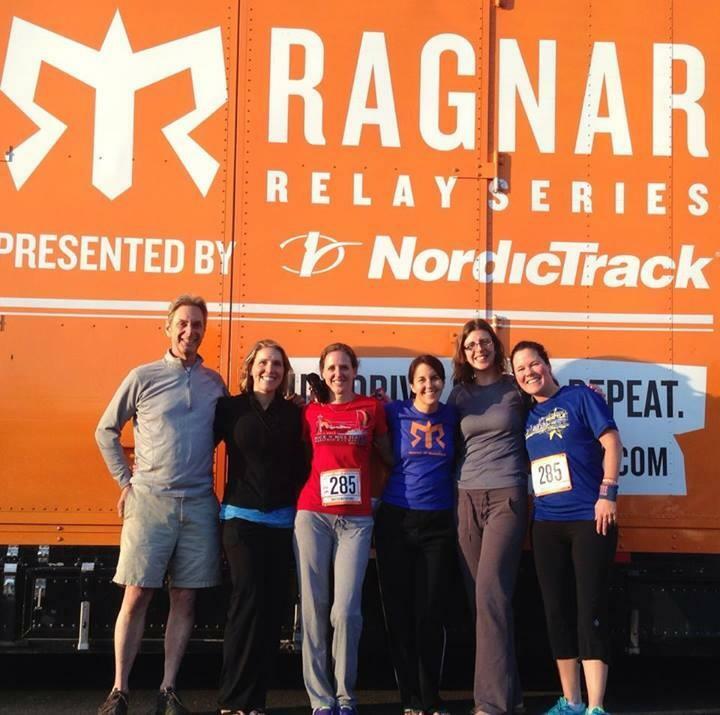 I'm seriously in a post-Ragnar let-down now! So, let's see. I'll start with packing. I started planning my packing right after I found out I was doing Ragnar, so about two weeks out. 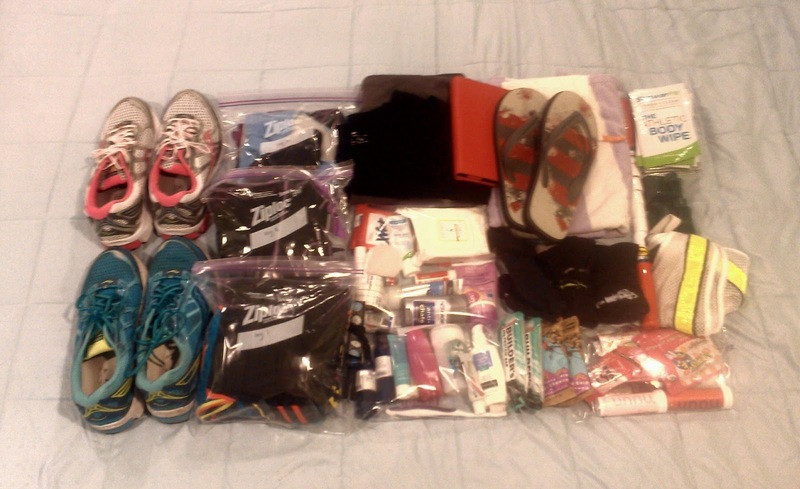 I consulted many different blog posts about packing for a relay (yes, I'm a little Type A sometimes) and I think the best tip I gleaned was this one: pack three completely separate running outfits, one outfit in each in a gallon sized ziploc bag. Not only did it help me stay organized, it helped me dress quickly (okay, sorta quickly) and gave me a place to stuff my gross clothes after I ran. I chose to take (roughly running down the columns of gear, L-R): two pairs of running shoes, three bags of running clothes (two bags had my cw-x capris in addition to my running shorts), sweat pants, underwear, regular bra, t-shirt, kindle fire, ziploc bag of things like: face wipes, hand wipes, leukotape, sunscreen, ibuprofen, arnica, ear plugs, blister cream (spoiler alert: it didn't work), tums, body glide . . . basically a running-related first-aid kit, ziploc bag of bathroom essentials like: face and body wash, shampoo, conditioner, face lotion, deodorant, toothbrush and toothpaste, two headbands, several hair ties, then flip-flops for the shower, towel and washcloth, pro-compression socks, arm sleeves, snack bars, The Stick, shower pills (packets of anti-bacterial body wipes), 2 cow bells, reflective vest, bag-o-gels, chews and nuun. Not pictured: Birkenstocks, sleeping bag, thermarest, pillow, sweatshirt, phone charger, Garmin, Road ID. So what was essential? All of the running clothes. I liked having options and ended up not wearing only one thing (a pair of capris). Both of the pairs of running shoes I think were essential, but not everyone in my van had two pairs and they were fine. The bags of first-aid type things and all of the bathroom stuff were essential to me, but I was one of only two people in my van who showered during the relay. The shower was a MUST for me, by the way, and I chose to hit the showers when all of my team mates were hitting their sleeping bags on Friday night. I hate being dirty. I drank a lot of the nuun. The shower pills were awesome for de-stinking immediately post-run. Vest was a must to even run Ragnar. Cowbells, duh. My beloved Birkenstocks-- they were what I wore when I wasn't running. LOVE them. Having things in ziploc bags was a must. What do I wish I had brought? Not much, other than something "nicer" to wear at the finish line. I walked around the whole time in gray sweatpants and my new gray Ragnar sweatshirt and looked like a big gray slob. On Thursday night, after I crammed all of that stuff in to my backpack and set it by the door, I showered and went to bed. At 8:30pm. I had to be up at 3:30, which ended up being fine, because I was unable to sleep after about 2:30am. I was too excited! My team mates came around to pick me up in the big white van just after 4:00am and we drove up to Blaine for our 6:30am start time. The starting line was exciting but pretty toned down compared to, well, the rest of the run! We got our bibs and flags and all of the swag, then attended a safety-briefing before being set loose. Our team missed their 6:30 start time and so we sent Stephanie, runner #1, off at 6:45. I can't speak to all of the start lines, but, ours was pretty toned down. It was early and there weren't a ton of people there. I would say about 30 or so teams started with ours. At the start with van #1. Going in to Ragnar I only knew Michael and Kathleen. Michael has been a running buddy for well over a year, and Kathleen I have known from intervals class for just as long. Stephanie, Michelle and Heather all work together, but none of them knew Michael and I. Our common bond was Kathleen, who used to work with the other girls. Luckily we all got along well made a great team! The best trait to have if you're going to do a relay race? To be laid back and able to go with the flow. As I learned from my daughter's kindergarten teacher, you have to be able to say "oh, well!" As in: "I have to sleep on this cafeteria floor?! Oh well!" "I don't get van support on this leg?! Oh well!" or "I have use another f%^&in' porta potty?! Oh well!" So, back to the race. 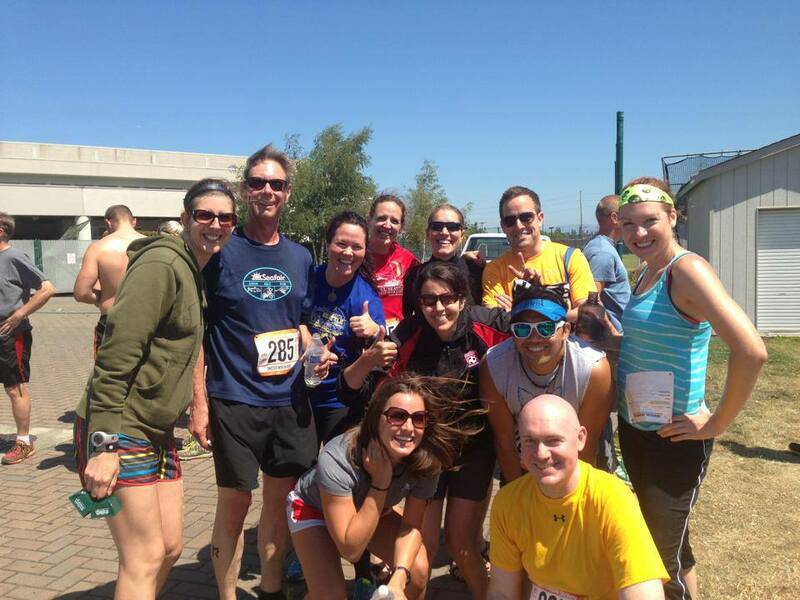 Once Stephanie was off, the rest of us jumped in the van to head down the course to cheer her on! In a relay, your runner takes off on his/her leg and the van drives ahead a couple of miles or so (depends on where the runner wants you to stop and cheer or give them water) and then parks to wait. So, we all jumped out and used the first stop to decorate our van windows a little and cheer on not only our runner, but every runner who went past. After that we drove ahead a little, stopped, cheered, then drove to the exchange. That was pretty much how it worked for almost every leg of every runner. Stephanie, on the far right in dark blue, ready to kill her first leg. Runner #2 for our team was Heather, she passed off to me each time as I was runner #3. Heather just passed the baton (aka the slap bracelet) to me. 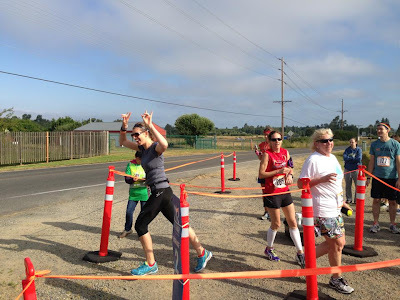 Clearly I had some enthusiasm about my first leg! I was so nervous and excited. My first leg was my longest. At the end it showed on my Garmin as 8.26 miles. I knew going in it would be very hilly and have an overall elevation gain, but I didn't find out until the last minute that there was no van support on this leg! The reason was there was apparently no safe places for the vans to pull over and let teammates out to come support, but honestly, I thought there were a lot of places the van could have stopped. And lots of other teams did end up stopping! I was glad mine didn't, though, because they could have gotten a strike for it (In Ragnar it's three strikes and you're out!). 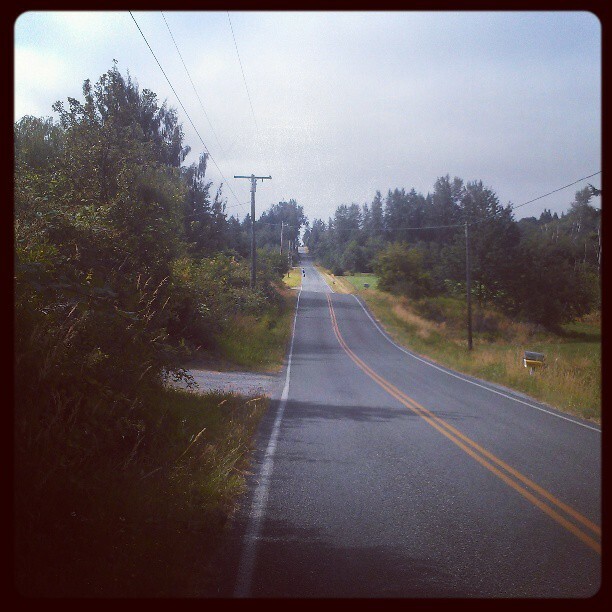 The run started out on a two lane back road in the country. The whole time we were running on the side of the road. It then turned and went down a much busier two lane highway for four miles. This part wasn't awful, but it wasn't great. Lots of big trucks would blow by and I put my head down, but luckily none of them kicked up a lot of dirt or anything. 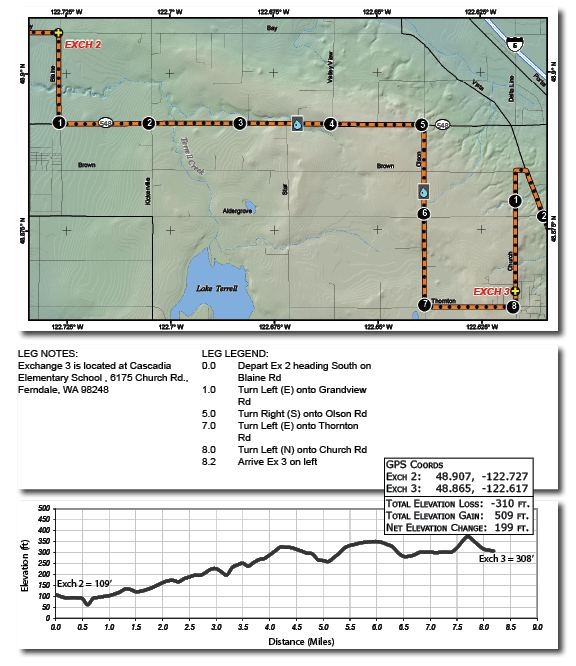 Ragnar had two water stations set up on the leg because we couldn't use van support. I appreciated the water and took a gel around mile 5. Along the highway there was basically nothing interesting, but the fields and trees were pretty. We turned south on Olson Road, and it was a bit more interesting. There were lots of animals (including what appeared to be a pen of geese?) and a handful of very sketchy looking mobile homes. And the hills. Oh, the hills! Pretty much we were rolling up and down the whole way. Nothing too steep, but they were long and rolling. I passed a few people and was passed by a few people. My legs were never had many people running. I could often run for a 1/2 mile or more without being near another person. Maybe starting so early in the morning meant that it wasn't as crowded on those legs? 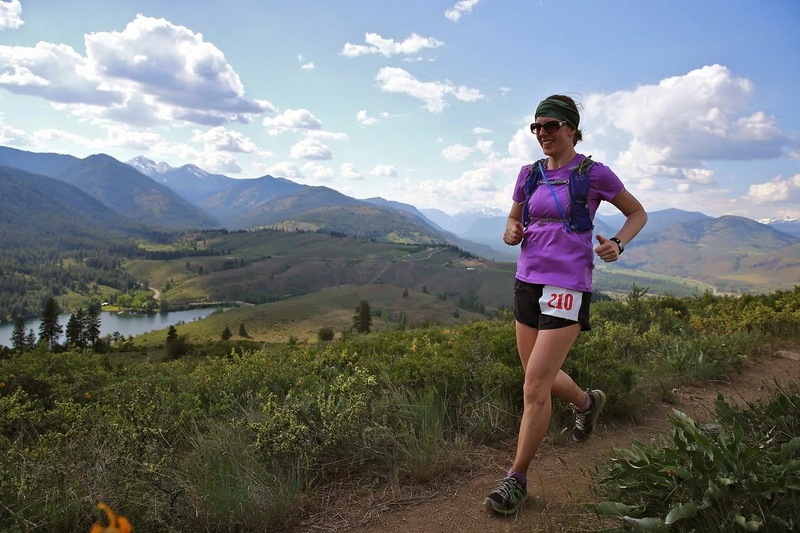 It was tough because I thought it would be a little more like a traditional race in that there would be a lot of us on the road at a time, but it was definitely much more lonely than that. I SO wish this looked as huge as it felt! This was about 2/3 of the way in to my first leg. I ran in to the city of Ferndale just before the end of the leg and was then running on sidewalks. The road went downhill a bit before making a turn north and to the exchange. There were a lot of people at the exchange so I got really excited to hear all of the cheers for the runners! I was waving my arms and yelling like a lunatic, it was so much fun. I passed off to Michelle, runner #4, and headed over to the van for water. Usually after a run that long I would take a lot of time to stretch, roll, re-fuel properly, shower, all of it. 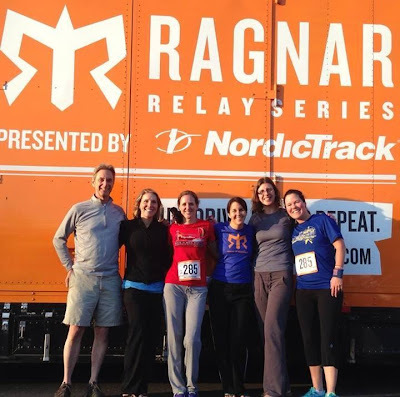 When you're at Ragnar you get a little creative. I had to hop right in the van so we could take off and cheer on Michelle! At the next exchange I used a shower pill (which is basically a large, thick anti-bacterial baby wipe) which felt good. I changed my shirt, left on my sports bra, but slipped out of my capris and put on the extra running shorts I had in my ziploc. Was tricky maneuvering in the van, but it worked. I stretched a little and passed The Stick over my legs a few times and called it good. 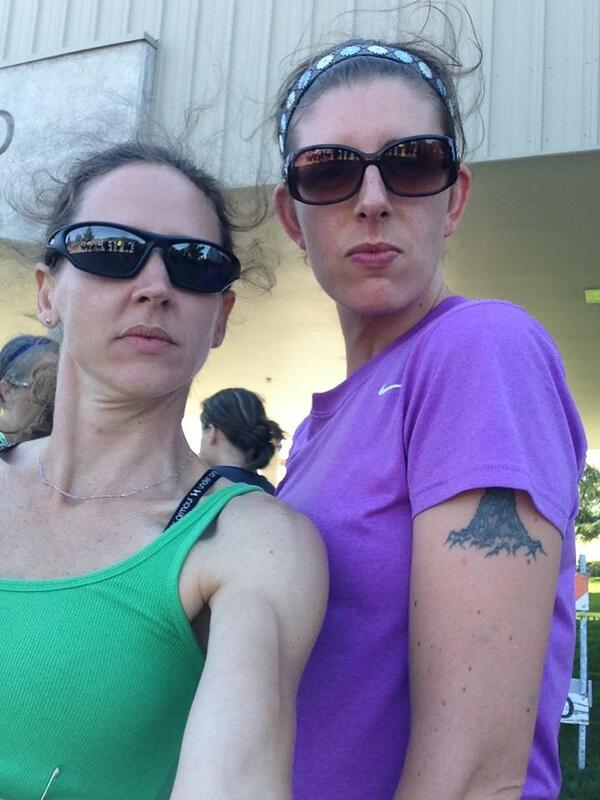 Michelle ran her shortest leg of her three, then it was time for Kathleen, runner #5 to head out. Her first leg was almost 6 miles and it was starting to get pretty warm out by that point. Michael was our last runner to go. 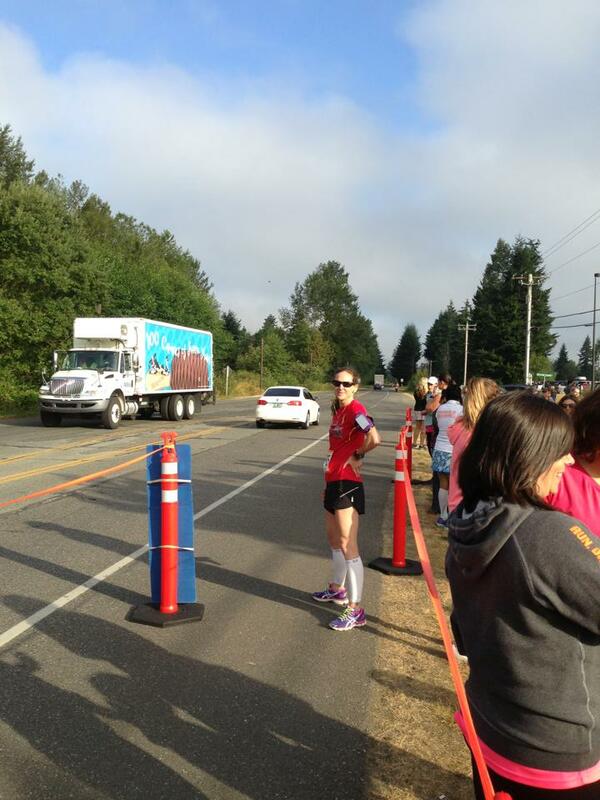 He ran in to Bellingham as the first major exchange, where van #1 hands off to van #2, was at Bellingham high school. Van #1 and Van #2, together for a moment! At this exchange we also got to purchase Ragnar gear and grab some free stuff before we piled back in the van and headed to lunch. Kathleen knew of the perfect lunch spot, which was Avenue Bread in downtown Bellingham. Oh my, best lunch ever. Then again, isn't every meal after a hard run the best ever? I tried not to embarrass myself by eating everything in sight . . . but I did get a delicious carrot cake cookie to go along with my meal. No photo, as I basically inhaled the whole thing. After lunch we drove to the next major exchange, at Burlington High School, where van #2 would end their first set of legs and we would start running again. When we got there we mostly tried to rest in the van and on the grass and hung out a bit until we got the call that runner #12 was on his way in to the exchange. This part was a little boring, I didn't really want to rest, I wasn't THAT tired, but I knew I needed the energy to run my next leg later in the day. Before we knew it, we got the call from van #2 that runner #12 was heading in to the exchange, so we got all ready to go again! 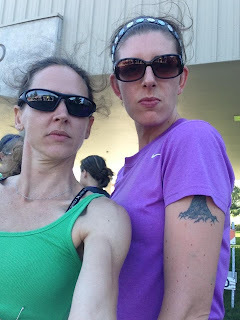 Heather and I trying to look tough at Exchange 12. Part 2 coming soon . . . . It was so much fun :) Thank you for letting me borrow your vest!